Genetics is the study of genes and inheritance in living organisms. This branch of science has a fascinating history, stretching from the 19th century when scientists began to study how organisms inherited traits from their parents, to the present day when we can read the “source code” of living things letter-by-letter. Genetics started out with curiosity about why things are the way things are – why do children resemble one parent more than another? Why do some species resemble each other more closely than others? It has evolved into an almost universal answer handbook for biology. By reading the “source code” or “blueprint” for an organism, scientists today are often able to pinpoint exactly where an organism came from, how it has changed over time, what diseases it might develop, and how its life processes are similar to or different from those of other organisms. In the 19th century, it was known that offspring resemble their parents – but almost nothing was known about why this happened. Why did some children “take after” one parent, but not the other. Why could plants and animals have offspring that had traits seen in neither parent? Why did some species resemble each other more closely than others? In the 19th century, Gregor Mendel began examining inheritance in a systematic way by breeding pea plants. He tracked several traits of pea plants across several generations, recording what kinds of parents had what kinds off offspring. He successfully derived the mathematics behind dominant and recessive genes – the first empirical evidence that traits really were passed down in some measurable way from parent to offspring. The image below shows a Punnett square of Mendel’s pea plants. The Punnett square was developed by English geneticist Reginald Punnett to visually represent how dominant and recessive traits were passed to offspring. 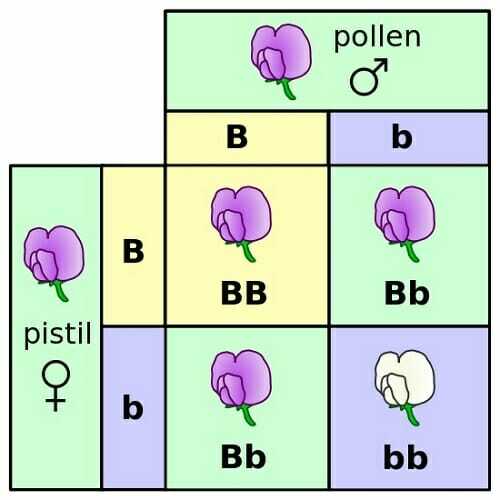 The math yielded by the Punnett square matched the results Mendel found in his hands-on studies of pea plants. Around the same time, Charles Darwin was writing “The Origin of Species,” after examining changes in the traits if island finches during times of drought and plenty. Darwin concluded that finches which had the traits best-suited for survival were most likely to survive to pass those traits on, yielding changes in the traits of the overall population over time. His work, when taken together with Mendel’s, began to suggest that all species on Earth might be related to each other, and might have gradually drifted apart by inheriting different traits through natural selection. From there, the field of genetics advanced slowly. By the early 20th century, scientists using light microscopes powerful enough to see into a cell’s nucleus suspected that chromosomes were the seat of genetic information. They were able to connect chromosomal inheritance to trait inheritance, proving that the “instructions” for inherited traits were carried on chromosomes within the nucleus of eukaryotic cells. The next great break in genetics started in the late 20th century, when the technology to read the nucleotide “source code” of the genome began to become available. Since then, the technology has gotten faster, more affordable, and more accurate – allowing scientists to sequence the whole genomes of many organisms and compare them. The ability to read the “source code of life” has led to a revolution in the way we think about and classify organisms. Prior to the advent of gene sequencing, scientists guessed at organisms’ relationships to each other by studying their physical characteristics. Organisms with similar characteristics were often assumed to be related – even though many examples were known of convergent evolution, where two unrelated organisms evolve the same traits separately. With the advent of gene sequencing and molecular genetics- referring to the ability to read the DNA molecule at the molecular level- it became possible to trace descent lineages directly. Scientists can now read a cell’s source code and determine at where, and roughly when, an organism’s genome changed. As a result, a great deal of material that was taught in schools as recently as ten years ago is now known to be incomplete. Archaea and bacteria – once classified in the same kingdom – are now known to be genetically quite different from each other. Fungi are now known to be more closely related to animals than plants. Many other fantastically weird and fascinating discoveries have come out of the genome revolution – each one bringing us a step closer to understanding what makes us who we are, and how we are interconnected. Gene sequencing has also led to a revolution in the way we think about, diagnose, and treat disease. In many cases, it’s now possible to know how likely a person is to get a given disease based on looking at their genome. Scientists hope that this will lead to great revolutions in medicine in the centuries to come – as medicine catches up to genetics, it may someday be possible to determine what medications will work best on a disease, or what lifestyle changes will keep a person healthy, simply by reading their DNA. This has also led to new ethical and economic challenges. Some women whose genes have certain mutation of the BRCA1/2 gene, for example, opt to have their breasts and ovaries removed even if they are healthy – because they know there is a high chance that they will develop cancer in these organs. In 2013, Angelina Jolie made headlines by going public with her choice to have her own breasts removed after finding out through a genetic test that she had an 87% chance of some day acquiring breast cancer. In other cases, geneticists can tell people that they will develop a serious disease – but do not yet have the tools to stop it from happening. People in families with Huntington’s disease, for example, can find out if they have the gene for this devastating and inevitably fatal dementia. But what can they do with this information? An unexpected economic challenge has come from health insurance companies. Insurance companies have always made their money by gambling on who was likely to get sick and who wasn’t. Now that the tools exist for companies to find out who is more likely to get sick at a very fine level of detail, concerns have been raised that people with unhealthy genes might be charged much more for health insurance than people with healthy genes. 1. Which of the following was NOT known when Gregor Mendel began his studies? C is correct. Mendel developed the theory of dominant and recessive genes after carefully studying the pattern of inheritance of traits among pea plants over several generations. 2. Which of the following was NOT a reason for misclassifying many organisms prior to the advent of molecular genetics? D is correct. Scientists of the past were incredibly innovative, designing experiments that yielded brilliant insights with very limited tools. But without the ability to read an organisms’ genetic code, they were restricted to making guesses about how to classify organisms based on their superficial characteristics. 3. Which of the following is NOT a possibility as genetic science advances? A. It may become possible to replace unhealthy genes with healthy genes, if a safe genetic engineering vector for humans is developed. B. It may become possible to choose the best medication for a disease right away based on the disease’s genetic profile. C. Laws may need to be passed ensuring that people with genes for certain illnesses are protected from discrimination and have access to healthcare. D is correct. All of these are possibilities for the next century, as scientists continue to learn more about genes and how to work with them! Darwin, C. (1902). Origin of species. New York: American Home Library Company.